Did you know today is St. Honoré Day, in honor of the patron saint of bakers and pâtissiers everywhere! And what more appropriate way to celebrate than with a Gâteau St. Honoré? Who was this mysterious figure to whom I really should be praying more often to have my breads rise properly, chocolate tempered perfectly, and buttercream frost smoothly? History has few facts about Honoré, but I did find out that he lived in the sixth century and was a bishop in Amiens, in northern France. During his reign several miracles were purported to have occurred, which led to his sainthood. 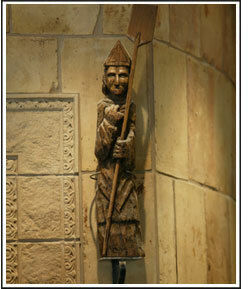 He eventually became the patron saint of bakers, and is often shown holding the long baker’s peel. Picture from Saint Honoré Bakery’s website – they’ve got a bit about the saint there as well! Honoré died on May 16th in 600 AD, and that day is still celebrated by bakers in France. So what about this Gâteau St. Honoré? It was supposed to have been created in 1846 by the pâtissier Chiboust, in honor of the saint and also because his own shop was on Rue St. Honoré in Paris. No stranger to the importance of names and legacy he – he created and named the famous Chiboust cream as well, to be used in the Gâteau St. Honoré! The recipes and construction for this cake has changed greatly over the years, with various doughs and fillings being used, but today the Gâteau St. Honoré typically has a base of puff pastry with a top ring of choux pastry, garnished with cream puffs around the border and filled with Chiboust or pastry cream. It is meant to showcase all of these wonderful inventions of French pâtissiere that endure to this day and give sweet pleasure to so many. The first time I made a Gâteau St. Honoré was in pastry school; the miraculous thing was watching how a base of puff pastry with a ring of choux paste on top would bake up perfectly in the same amount of time! Then there was the assembly of the cream puffs, dipping them in caramel, and attaching them to the base. 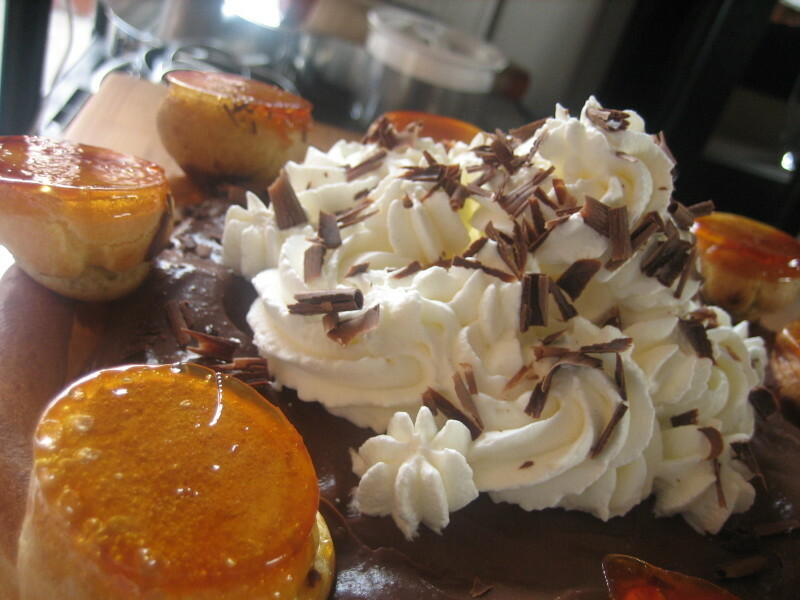 Finally, filling the center with pastry cream and decorating with whipped cream. This was a real project; something that took the better part of an afternoon, multitudes of bowls and tools, and made you feel at the end like you’d really accomplished something. For this year’s Gâteau St. Honoré, I decided to use a recipe from Pierre Hermé’s Chocolate Desserts , which showcases his enviable ability to take the classics and put his own intimitable spin on them. Instead of the traditional vanilla pastry cream filling for the cream puffs, he uses chocolate pastry cream. Hermé calls for a layer of pears and chocolate whipped cream in the center of the base in lieu of regular pastry cream, but I went for his all-chocolate variation and filled the center with a deep chocolate cream, topped with whipped cream and chocolate shavings. The result, is, of course, rich, chocolately, crunchy, sweet – a true celebration of all the sweet things in life. Happy St. Honoré Day! Credit: Much of the historical information for this post came from Meryle Evan’s article Saint Honoré – Patron Saint of Bakers and Pastry Chefs and the Evolution of the Cake Created in his Honor. The combination of puff and choux pastry, pastry cream, whipped cream, hard caramel and chocolate shavings – is definitely something to get excited about. Your Gâteau St. Honoré looks absolutely fantastic! Thanks for sharing your process and great historical information. what a great post! thanks for sharing. your dessert looks so good! i want to DIVE into that dessert!!! i literally moved like 6 inches closer to the screen when i got to its picture. oh man! hi anita, what a wonderful post! 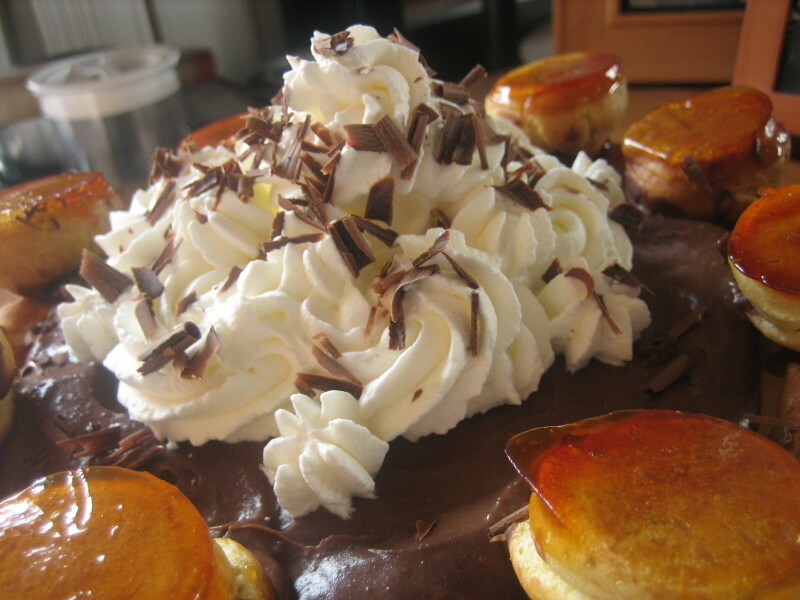 and utterly exquisite gateau saint honore – i’m in total awe, having long eyed that recipe in the book but never having quite gotten my act together enough to make choux, puff pastry, pastry cream and all the other components in one breath. what a magnificent tribute! Che bellezza! What a beautiful dessert! First of all, thank you for telling us all about St. Honore’. I had no idea I should be thankful to him when it comes to baking. Secondly, thank you for baking this most beautiful dessert and for sharing it. What a pleasure to read your post and what a joy to look at your pictures. Thank you! I was definitely thinking, “what else could they possibly stuff in this recipe?” when I made it! Thank you!It was a fun to make…and eat! Your posts have already shown off your enviable multi-tasking abilities, I’m sure you’d pull this off fantastically:) Thank you! Anita, just awesome. Although I’m quite confident in my own baking abilities, I could never make something like that — not in a thousand years. Congratulations! Thank you! It was really fun to put together! Thank you to “Cream puffs in Venice” for this blog adress ! But what do you call a graham cracker ? Thank you for these pages of happiness. Thank you for visiting and I’m glad you like my page! I find yours very charming as well! I’m not sure what graham cracker is in French – I’ll have to find out!